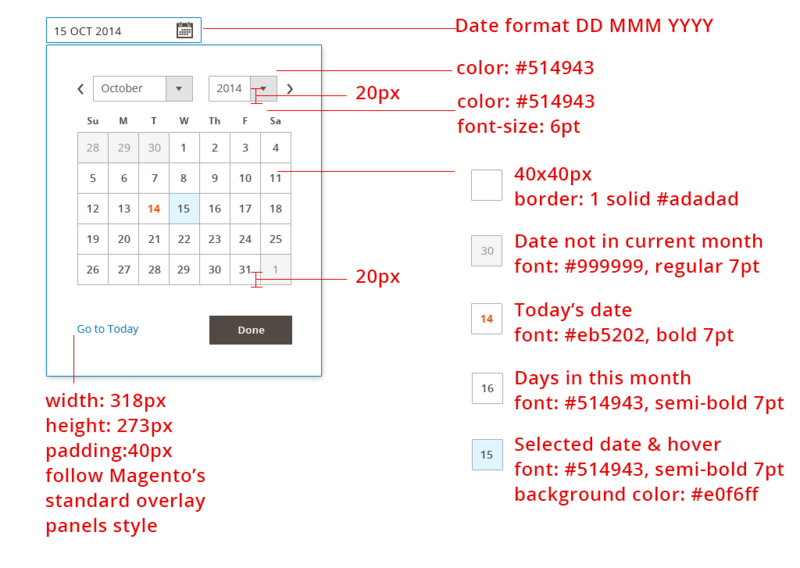 This topic discusses design standards and rules for date and time selection in Magento. This article is related to the Form Elements pattern. 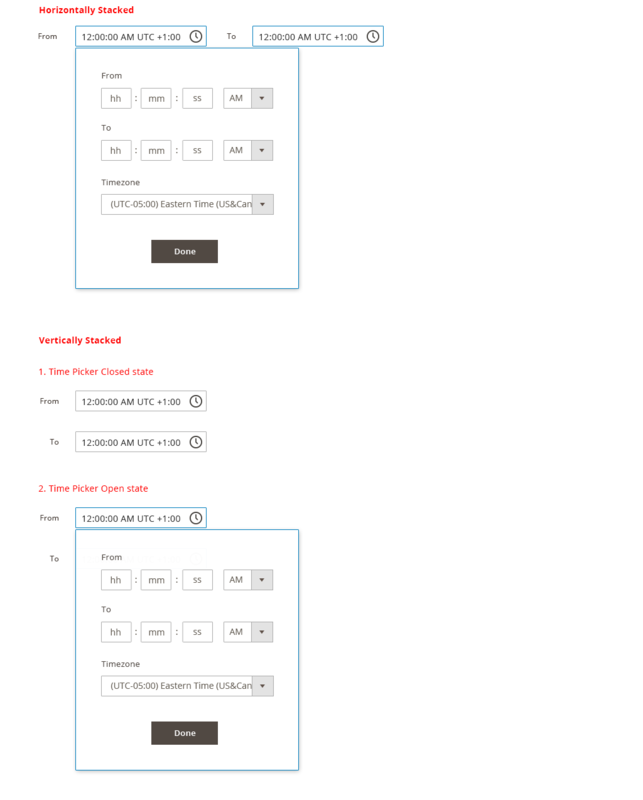 Please refer to Form Elements for general rules on form usage and placement. Use this element whenever a date, date range, time or time range needs to be gathered from the user. DD MMM YYYY (ie. 01 JAN 2014) The letters should be localized. The examples in this article use the 12 hour clock format. It should be noted that the 24 hour format will be supported as well. If either MM or DD is above 12, then we can tell which one is the date vs month. If both slots are below 12, make a guess based on the region. For example, if the user is in the US, guess MM/DD/YYYY format. If the user is in the London, guess DD/MM/YYYY. The more commonly used ones are DD/MM/YYYY. 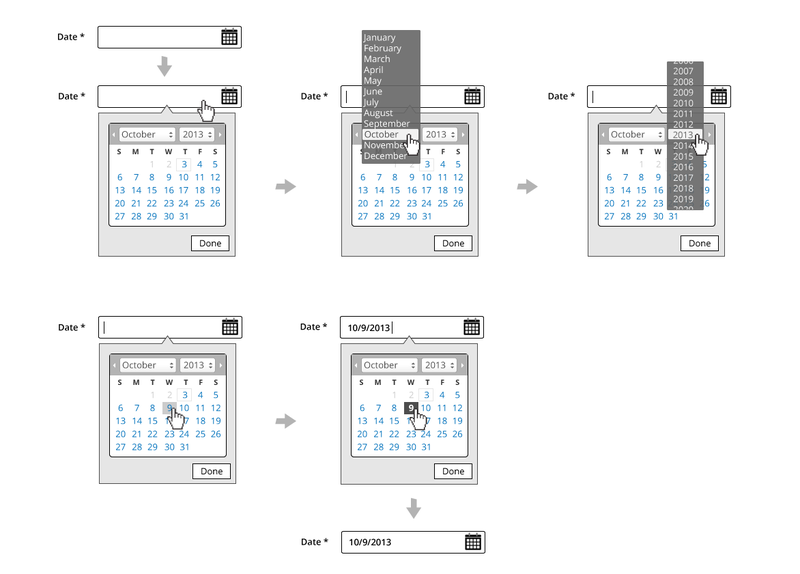 The initial text field assumes the typical tab orders used in form field pattern. 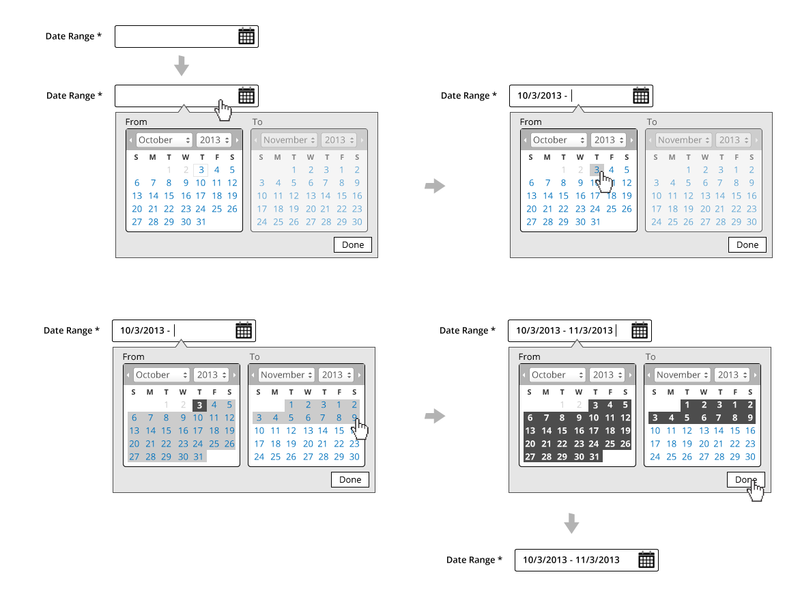 Space and/or Enter selects a day and deletes all multiple or range selection. Shift+Page Up moves the focus to same day in the previous year. Shift+Page Down moves the focus to same day in the next year. Ctrl+Home moves the focus to the first day of the year. Ctrl+End moves the focus to the last day of the year. Shift+Arrow performs continuous selection to the next/previous day/week/month. Ctrl+Space multiple selection of certain days. Esc closes a DatePicker that is opened as a Popup. The current month should have a label representing the month and year. This should have a role header but is not essential. This “label” should have a unique ID. When a day is selected it should have aria-selected=”true” otherwise it should be set to “false” or removed. When the datepicker is active a calendar day of the week should always have focus. This can be achieved by setting the tabindex on that day as appropriate and then using script to give it focus. Alternatively, the grid container could set aria-activedescendant to the id of the currently focused gridcell. Keep in mind that older browsers may not support aria-activedescendant. 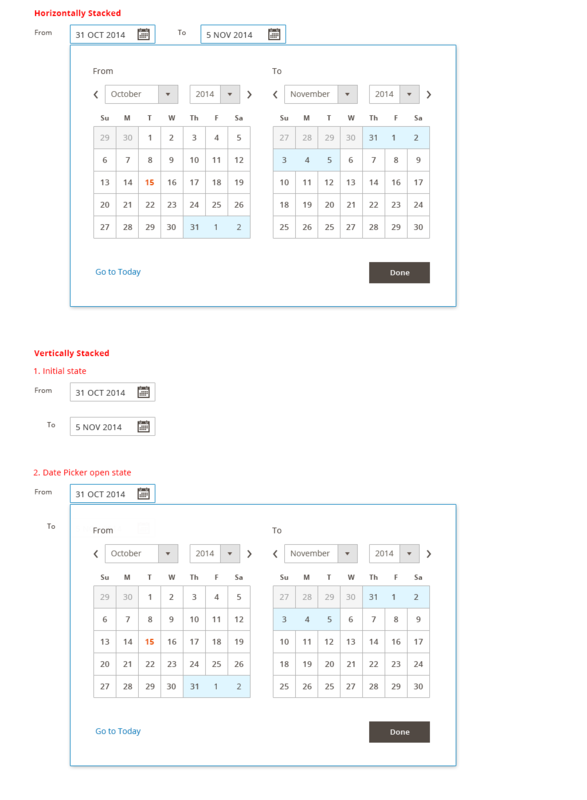 Date and time selectors are implemented using the standard jQuery UI datepicker widget and Magento addon.